Tammy Faye Messner may be battling stage four colon cancer, but she wants her fans to hear some encouraging news: she’s gaining weight. After her weight plummeted to a dangerous 60 pounds, Tammy Faye wrote on her website that doctors have stopped trying to cure her deadly disease. 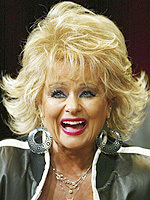 But in a new letter on her website, a brave Tammy Faye revealed she recently gained five pounds. She ends the note cheerfully, saying, “I will let you know when I get to eat my hamburger! HA!"